Hantu Raya in early Malay animism, refers to a supreme ghost or demon that acts as a double for a black magic practitioner. Like the Toyol it has a master. In Malay folklore, it is a spirit which is suppose to confer the owner with great power. Hantu means ghost and raya, great, in Malay. 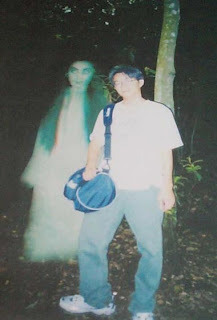 Hantu Raya originates in Malaysia and is said to be the master of all ghosts (hantu). It is the leader of the underworld legion and those who make alliance with it, are considered powerful. Hantu Raya is the acronym for Hantu or Ghost and Raya, large, huge, supreme, enormous, great, as in "Malaysia Raya" and "Asia Raya" and Hari Raya (Great Celebration or Festival). In modern Islamic Malay culture, the belief in Hantu Raya is no longer valid, but rather it is identified with a demon, Satan and the Djinn (Genie). Muslims believe that djinns and demons are more powerful than man but less intelligent. In ancient times, the Malay spirituality was a mix of animism, Hinduism and Buddhism. Spirit worship was not uncommon and these beliefs persisted in rural areas until the latter half of the 20th century. In the case of Hantu Raya, the owner is said to have formed a pact with demon or inherited it from older generations in the form known as Saka or legacy which is handed on down the generations. In return for the advantages and power, the owner agrees to provide for the ghost and appoints a new owner for it before dying. According to legend, people who fail to untie their bond with the hantu will suffer especially during death. Hantu Raya will resemble the look of its owner ever after death and go roaming. People seeing him will assume that the deceased has been brought back to life. It will search for food and new owner at night and goes around haunting people. Another legend goes that the dying soul will face difficulty in dying and becomes a living corpse or zombie.